I still reach for them often; those dog eared, dripped on, food stained recipe cards that symbolize a gift of years gone by. Those precious ladies took pity on me, the soon to be, new bride with not a lot of cooking experience in her arsenal of tricks. Quick and easy was the request they put out. Little did they know it would become a mantra that I share with thousands. And so another evening begins. 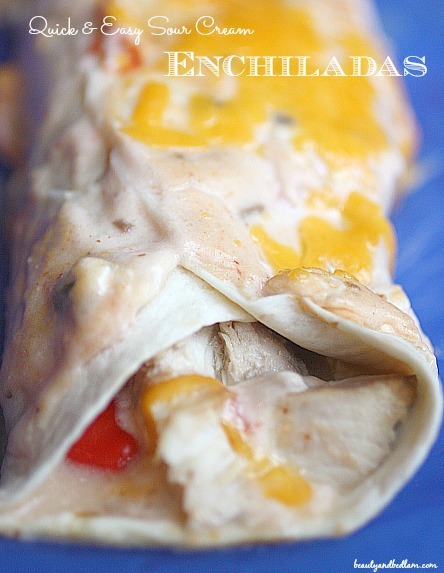 I reach for one of my favorites, Sour Cream Chicken Enchilada Recipe. With the chicken scratch recipe written on a simple index card, it brings back so many memories and equals easy comfort food at its finest. Yes, it’s served us well for over 20 years. Another one of those “Go to’s” on a busy evening where you want your family and friends to think you actually spent oodles of time making something really special because in your heart, you want to. They matter and you want to show them, but that dinner hour just got away. This definitely meets my criteria for a 10 Minute Dinner when I use my pre-cooked and shredded chicken already on hand from my Power Cooking Hour. 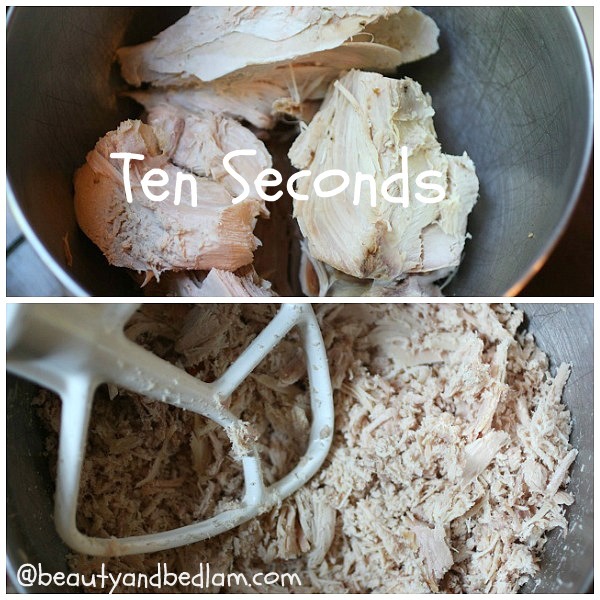 Save money and use my tip for shredding chicken in seconds . You won’t believe the number of meals that will be ready with only ten minutes of prep time, but this is another great recipe for using up that left over Rotisserie chicken or the chicken that you grilled in bulk. Remember, this is another recipe with much versatility and it’s one that I’ve added to my list of recipes I want my kids to know by heart. When I first start cooking, I followed the recipe completely as written but the beauty of this process is improvising to your tastes. Now I might make more sauce, add extra cheese and chopped veggies like tomatoes, green, red and yellow peppers (you can see them peaking through in the pictures), add black beans, you name it. When serving company, I love this recipe because you can make half with just plain cheese, chicken and sauce filling and then fill the second half with veggies for those who love both. 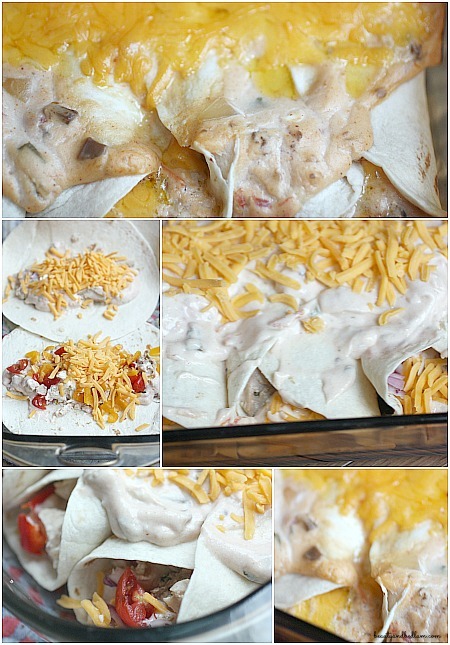 I always double or triple this recipe because left overs are AMAZING!! I just love recipes like this and I hope you do too. You can not mess this up. Enjoy one of our favorite family meals. Isn’t it amazing how a simple recipe can bring back so many memories? 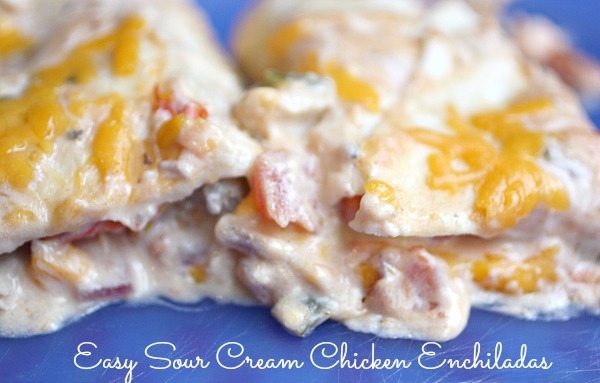 Summary: This quick and easy Sour Cream Chicken Enchilada recipe will surely become a staple in your home. So delicious! Mix the cream soup, sour cream and salsa to create sauce. Put cooked chicken pieces, grated Cheddar and/or Monterey Jack, more salsa (optional), chopped onions/veggies (optional) in the center of six flour tortillas. In oven proof pan, spread thin layer of soup mixture on bottom. Place rolled tortillas on top. Pour rest of the sauce over the top of the tortillas. Cover with more grated cheese. Serve with shredded lettuce and tomatoes. I know what’s for dinner tomorrow! Thanks for this! Tried and true are the best. Those are my kind of meals – quick and easy! Yum! Looks like a recipe my grandma makes! What type of cream soup? Cream of chicken? You can really use what ever is your favorite. I tend to use either cream of chicken, mushroom or celery. What temp do you bake them at?